The holidays are officially here! We're getting started with the Holiday Grunch Event. This is just a warm up, because we have something special starting next week that will run from Dec 19 - Jan 2. I'll be announcing details soon. I hate all those Whoms! How they sing and they shout! I'd love to destroy them, and rip their guts out! The Grunch had an idea! An awful idea! The Grunch had a wonderful, awful idea! Grunches and Whoms have invaded the Wasteland! Seek out Cindy Loom Whom, found in Spider Hill, New Flagstaff, Trader’s Flat and Los Alamos. If you can stop the Grunch and bring back some of the xmas gifts he stole Cindy will give you a special holiday reward. 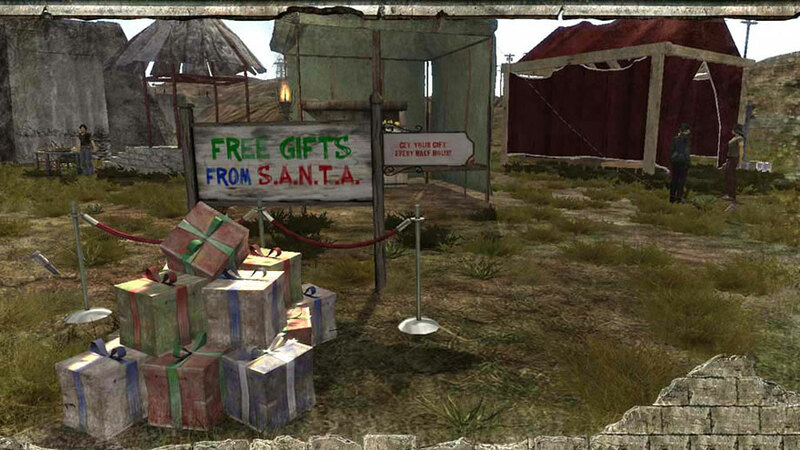 Players Level 46-55 can take a second mission to earn an exclusive (and antlered) bonus reward. Since the Fall, computer glitches and leap years have created controversy over the actual date of the New Year. For decades now, people in all areas of the Grand Canyon Province have used different dates, leading to much confusion. Now, the Archivist Coalition, with the help of LifeNet, has finally determined the actual date of the New Year. In the process of their research, the Coalition has also uncovered a great deal of information about various holidays that had been celebrated in the past. In honor of the establishment of the true date, the Coalition is sponsoring “First Night” a festival that combines many of the holidays past. There might not be any snow in the Wasteland, but citizens from all over the Grand Canyon Province can join together, build some Dirtmen, and wait for the arrival of S.A.N.T.A (the Seasonal Arctic Network of Toy-based Altruism). They’ve been keeping track of who's naughty and nice. The nice get gifts and the naughty get hunted down. Hope you were nice! There will be plenty more celebrating where that came from, as well as holiday missions and goodies. Enjoy party crackers, fruitcake, and festive top hats from gift boxes, or trade the unopened boxes in for a chance to win the ultra-rare white top hat. Got any questions? Want to chat with other players? Then discuss this article in our Forums! You can also follow us on Twitter and Facebook.